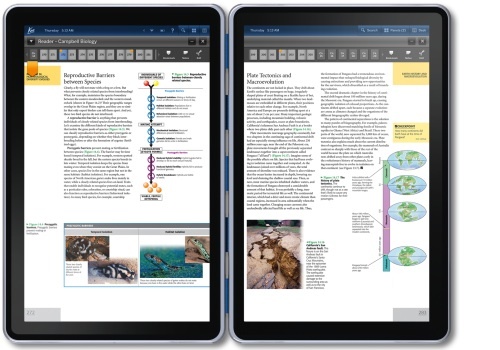 Kno started selling its textbook tablets last year, with a $599 single-screen version and an $899 dual-screen. But, as I’ve noted before, competing against the iPad and Android tablets makes absolutely no sense. If a student is going to buy a tablet, they will buy one of those first. Nobody is going to carry around two tablets. Plus, you can’t play Angry Birds on a Kno. To be fair, Kno began to design its tablet before the iPad launched. “We started to build a tablet in 2009 because we believed the tablet form factor was the way to go,” says Rashid. “Over last few quarters the world has changed with tablets. Our core strength was software.” Sales of the Kno tablets were underwhelming, and anyone who bought one will be offered a refund if they want to return it. Or they can keep it (the tablet is actually pretty decent). As part of the financing, Intel will also license Kno’s hardware design to work with OEMs to build future tablets. Again, unless these future tablets run Android, I don’t see the point. Kno itself will now focus on recreating its textbooks and associated software for the existing tablet market. Expect to see an Android or iPad app very soon. Of course, this will change the entire economics of the business, especially if Kno now has to split textbook sales or subscriptions with Apple on the iPad.